Its always a joy when the Domino Dollhouse Look Book drops into my inbox, and this collection is no exception. With hints of leopard print, cosmic print and biker grunge chic, it's definitely rocking my world. I bloody love DD and that leopard and black dress is amaaaazing! just wondering where the name 'BeBe' came from? and do you say it 'Bee Bee?' Just my friends name is 'Bebee' pronounced 'Bee Bee' and I've never heard anything else like it before! Hello, hope you don't mind me asking but is it a massive hassle getting the DD stuff shipped from the states? 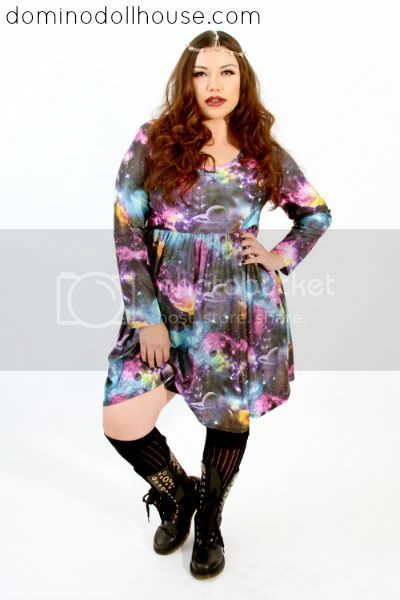 I love the galaxy dress but the thought of paying US duties just puts me off. Thanks so much, and also should say I bloody LOVE your blog, thanks for making me feel so much better about myself!